Students may be familiar with the subway and bus, but what came before? 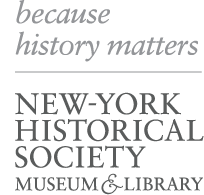 Investigate artifacts and images of vehicles from New York City’s past and discuss how and why transportation has changed over time. How did our modern skyline come to be? Compare buildings from New York City’s past to those in the city today and investigate how and why architecture has changed over time. How do maps illustrate change over time? Explore New York maps from different eras to analyze how our city is different today. Learn how cartographers use visual symbols to convey important information about a place. Why is the work of John James Audubon still important to study today? Discover this influential figure and his renowned portfolio, The Birds of America, which made lasting contributions to science, conservation, and art. How did the climate, environment, and natural resources of the Hudson Bay influence the Munsee way of life? Investigate artifacts made and used by the Munsee people, and analyze drawings to learn about the resourceful, semi-nomadic people who populated our region long before European settlers arrived. How was daily life in New Amsterdam different from life in the Netherlands? Dutch colonial artifacts highlight the many challenges faced by citizens of New Amsterdam in contrast to the wealth and prosperity in Europe as depicted in Dutch still life paintings. Why was printmaking an essential art form during the American Revolution? Examine the causes of the American Revolution through broadsides, art, and artifacts, and discuss why our country fought for independence. Why is it important to preserve the stories of enslaved New Yorkers? Use artifacts and runaway advertisements to piece together the experiences of enslaved people who lived and worked in New York City. How did the Civil War affect New York City and its residents? Compare various groups of New Yorkers and their responses to the national conflict, and examine how battlefield war artists captured scenes of the war through charcoal illustration. How did the pioneers shape the American West? Learn about the challenges settlers faced on the frontier by analyzing artifacts and images, then study Hudson River School landscapes to discover what motivated so many to go west. What was the process and emotional impact of immigration in the early 20th century? Analyze artifacts, photographs, and Expressionist works of art produced by immigrant artists, then create an immigrant narrative that describes the process of immigration to the U.S. in the early 1900s. How did New Yorkers’ lives change during the Industrial Revolution? Using artifacts and images along with breathtaking Tiffany lamps, imagine how key innovations modernized America at the turn of the 20th century and shaped the daily lives of New Yorkers. Complete our booking form to start the scheduling process.